"Have you any idea how many people have been looking for you ?" Scandal as child favourite caught in the arms of two escorts. "There's usually more people than this." "You say you don't know who you are? Let's see if we can find you in the book." "What's the charge?" "Impersonating Piers Morgan"
At last he's been found! They'll throw the book at him. Wally or won't he be charged?. "Having to arrest him, I did feel a bit of a wally." "Sorry Sir, advertising is not allowed here including Signal toothpaste." A new Government initiative to reduce over crowding in our prisons has lead to some criminals now being sentenced to 6 months in Dudley. "If only it was this easy to locate Carmen Sandiego." Sunderland supporter with his head through the armhole. 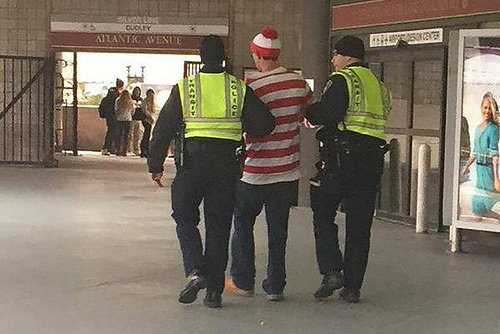 Police arrest Wally near Hide Park. Regarding Wally jokes, I think it's the end of the line. "You are wanted on suspicion of stealing a floor"